Agriculture Min. Uri Ariel tells Arutz Sheva NGOs which attack IDF abuse state funding, after ACRI turns to the Attorney General over ban. 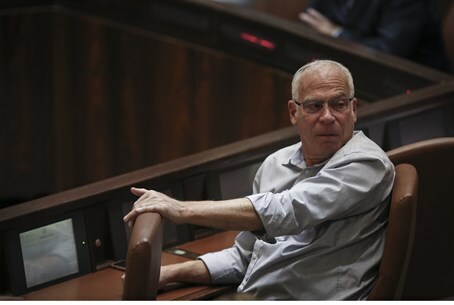 Agriculture Minister Uri Ariel (Jewish Home) defended his decision to bar the Association for Civil Rights in Israel (ACRI) from receiving national service assistance on Wednesday, after it filed a complaint over the issue to the Attorney General's Office (AGO). "The reality in which there are associations which attack the State of Israel and IDF soldiers and then receive state-funded assistance in the form of national service volunteers - and where the citizens of the State of Israel are financing them - will not happen on my watch," Ariel stated to Arutz Sheva. Ariel added that while each organization has the democratic right to oppose the State of Israel, it does not have the right to get state tax money for doing so, in his view. Earlier Wednesday, ACRI's legal adviser, Attorney Dan Yakir, sent a letter to the Deputy Attorney General, attorney Dina Zilber, and wrote: "Instead of dealing with the issues in their own officers, recently several leading ministers and MKs have campaigned to delegitimize human rights organizations in a variety of suggestions law aimed at limiting their activities." "The Minister's announcement," wrote Yakir, "is part of this smear campaign, which aims to threaten human rights organizations and to impose sanctions to silence criticism of the government." Yakir asked the AGO to intervene, calling to move "using force to exert power and political persuasion." Ariel, who is responsible for the National Insurance Institute that supervises the national service program, also stripped the national service status of far-left B'Tselem, which was one of ten radical groups which provided information to help the United Nations (UN) condemn Israel in a biased report on Operation Protective Edge in Gaza. ACRI, like B'Tselem, claimed that it never submitted any information to the UN, however. "We were surprised to find out that the minister issued a news release without addressing the basics - ACRI did not transfer materials to the committee of the United Nations," the organization said. "References in the report relate to letters that were addressed to the Attorney General, and which appeared on our website, and are calling for an independent investigation regarding the instructions given and taken during Protective Edge."